before having kids i was an elementary school teacher. i actually taught 2nd grade for the two years that i worked full-time in the classroom before having my first baby. one of my favorite things to do with my students as a learning center and as one of those "time-fillers" for the 2-3 minutes they finished a project early before the rest of the class or were waiting for the 2 minutes before the final bell rang to go home for the day was a puzzle. 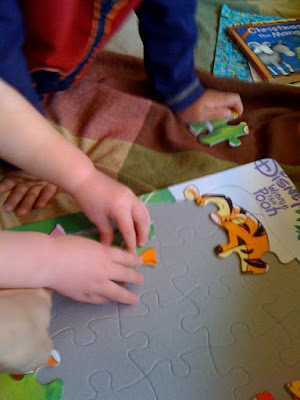 i loved to always have a puzzle on the blue table in my classroom that was a work in progress. a student would put in a piece or two here and there and as a whole class we would slowly chip away at finishing it together. my students got pretty skilled for 7 year olds at puzzles. i remember the hardest one i brought in was a 500 piece puzzle that ended up having very odd pieces when i opened it up. i thought, oh great! i picked one that they will not be able to finish. i wondered if it would end up being demoralizing to have something way beyond the age and ability level they were at. i even had other adults sit down once in a while when they stopped by and marvel at the difficulty of the puzzle we were undertaking. yet, little by little, with great patience and perseverance, my class of second graders finished the difficult puzzle! it was one of those moments when i was not only proud of them, but honestly surprised that they were even able to do it. what a great example that was to me that the most difficult tasks can be completed one small piece at a time. it doesn't necessarily matter my skill level or even my confidence. it is all about the patience and perseverance of doing the little i can and not giving up until it is completed. now i do puzzles with my kids. asher, my six year old, has been putting puzzles together since before he was even a year old. now he is amazing at the puzzles that he can finish! with each child i have taken some time, some amazing bonding time, to teach them the skills and strategies of completing a puzzle. we talk about doing the edges first, then matching colors, shapes, the male to female sides, and all the different ways that they can use trial and error to find that one missing piece. today i took some puzzle time with my four year old and two year old. my four year old and i taught the younger one how to figure out which piece to try where and which side to try if one didn't work. it once again reminded me about patience and perseverance. we all want that kind of hope - the hope anchored in Him who laid down His life before we even loved Him. let's persevere through whatever lay before us, even if it seems a task too big or too difficult, and practice patience in our pursuit of doing one small piece at a time. we will see the other side and the other side is good, but along the way we will gain hope because in the step by step, piece by piece journey, we will realize that He is there with us all along.